1, Easily upload your design on the products and buy it. 2, Fit Jeep,Honda,Toyota tire etc..Choose by size. 2, Made of 210D woven polyester material, water-proof. 3, With inside tighten rope to secure cover from wind. 4, Fit Jeep,Honda,Toyota tire etc...Choose by size. Question: Where is your company? i just ordered and it says the payee has an oriental name? 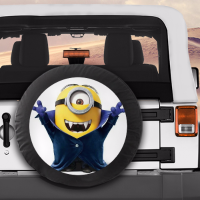 Question: Do you sell a cover which will fit my 33" tire? Question: I'm not sure which size of cover will fit for my tire, any help here? Question: How long about the delivery? 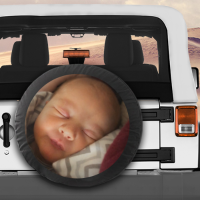 Question: Can you edit the design for me, since I want add some text on my image? Is there any extra fee for it? 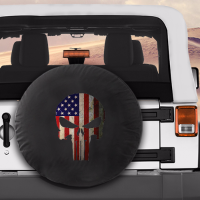 Question: I want to order the tire cover with the black logo, because I have only black design for it now. Question: Where can I check the tracking info of my purchase? Question: My car tire is 33", whether this cover fit for my tire? Question: To whom will see. I want a white cover with my design. do you have the white cover? Thank you! Question: Is there any way to get a discount if I order two? Question: Is it possible to make the Jurassic Park logo larger on the cover? Question: It's because I want no color just white the flowers white and the letters since my Jeep is red and the colorful colors wouldn't Look good and how would I be able to get my order the way I want it?? Question: I was wondering If I could get this flower design but, in white and in the middle have a B in white too and instead of "Wendy Brown" just Brissa. Question: Can I add some words on this cover, and how much? Question: Wow! I love this design very much. I bought 2 covers from you months ago, and they were really good. And you gave me a discount and let me contact with you when I need purchase. Now I want to buy 4 tire covers.Can I use the discount now? Question: Hi there, I like the eagles on the cover very much, but I just want there is one eagle like this on my cover, can you do it for me? Thanks! It is thin, but I can accept this as it is not an expensive cover. The print is good. I like it. Great product. Great seller. Very impressed, would do business with again. I didn't expect this product to be a 5 star, because it's so cheap. It proved me wrong. It fit our tire exactly, was easy to put on and stays exactly where we put it. I'll buy this again. The quality is good. But It took 2 weeks to arrive. I miss my friend's son birthday. We are sorry for the delivery later. We will change it next time.